Well, today did not go as planned. I woke up at my normal time, but I was not even out of bed before I heard the thunder out the window. I just rolled over and went back to sleep. A few weeks ago, I woke up on a similar morning and got dressed and went out for my walk and I immediately noticed that it had recently rained. It was much cooler than the previous mornings so I thought "Oh! This is wonderful, I will have a fresh cool walk this morning." And how naive I was. I was about a half mile from home when there was a huge crack of thunder right behind me. It scared me half to death and I took off running back toward the house. Of course, it started pouring down rain and I was soaked to the bone by the time I got back to my house. I am just glad I made it home without getting struck by lightning. I think getting struck by lightning is one of my biggest fears. Completely frightening. That day was on my mind this morning when I decided to sleep in instead of working out. I got out of bed with just enough time to take a quick shower and grab my breakfast before time to get to work. But my schedule was off and my day did not go well. I think it was at least partly because I didn't get my workout in and my day just started off behind the curve. Work did not go well. Nothing really went my way today. We're nearing the end of the day and I am not even at 3,000 steps for the day. This is by far my worst step day in a long time. Do you like my Fitbit? 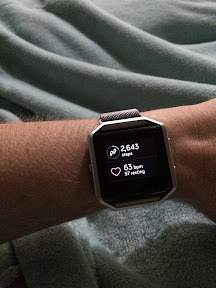 It's a Fitbit Blaze. I love this thing! I got a new metal mesh band for it so that it will look a little dressier than the blue plastic band that it came with. I like the fact that it tracks my steps, my sleep, my heart rate, and so much more. And it's right there on my wrist. I don't even have to look at my phone. It also alerts me to phone calls, text messages, meetings, and alerts. 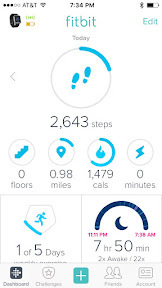 Fitbit also has a new iPhone app. I like their new dashboard layout. It has a nice clean look but shows everything I need to know at a glance. I like it a lot better when my stats are up to par though. Do you have a Fitbit tracker? If so, which one?